It's almost a month I did blogging. 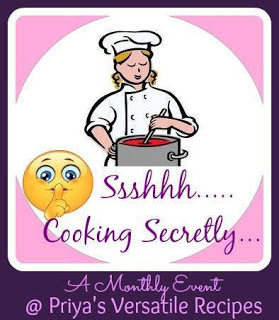 May month was really hectic for me in both health and travel wise but still, the one event which I never miss is my favourite Shhh Cooking Secretly Challenge which happens every month with an interesting theme. Likewise, our May month theme was Stuffed recipes and I was paired with a Wonderful blogger Sharanya Palanisshami from Sara's Tasty Buds. Peas and one ingredient of my choice were given as the secret ingredients by her and I chose sausage as my second ingredient. Likewise, Check out her page too to view an interesting recipe prepared by her using the secret ingredients given by me. Sausage and Peas stuffed pastry cups is an interesting party snacks filled with pea - cheese puree and grated sausages. The fresh peas are boiled along with garlic pods and made into puree by adding cheese. I have added mozzarella cheese as it gives a nice texture to the puree. The sausages are sautéed along with fresh rosemary herbs which gives a lovely flavour to the snack. The cups are finally topped with more cheese and baked to get a delicious cheesy snack. Boil green peas and garlic pods in a water. Once it gets cooked, drain the water and cool it. ( The drained water can be used for kneading roti or used in rasam or sambhar to enhance the taste ). Grind into puree by adding mozzarella cheese and little salt. Keep it aside. Heat oil or butter in a pan and add grated sausages along with a little salt and rosemary herbs. Saute for a minute and remove from the flame. Keep aside. Now, take a puff pastry and roll into a rectangle shape. Cut the pastry sheet into 6 equal squares. Grease the muffin tray ( or use silicon muffin cups ) and place the square shaped puff pastry in each muffin moulds. Now fill the cups with a little pea puree and then with sautéed sausages. Finally top it with grated cheese. Repeat the process for the remaining pastry cups. Bake it for 25 - 30 mins at 180 degree C in a pre heated oven or till it turns crispy. Once done, remove from the oven and serve hot. I love puff pastry cups and pies.. perfect tea time snack. A wonderful stuffed snack. I love puff pastry and often make small pastry stuffed with mushrooms. Peas and mozzarella sounds good. real cute pick me ups - apt for a party !